Emergency Dental Care: What to do until you see Dr. Pate. We handle dental emergencies all the time. 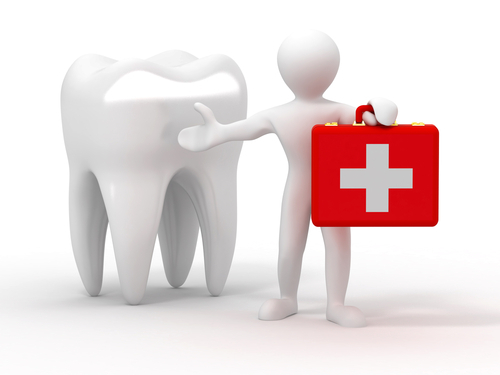 If you have a dental emergency, please call the office immediately at 404-266-9424 so that you can see Dr. Pate. The most common dental emergencies are knocking out or loosening a tooth, a major toothache, and losing a crown. For problems like severe trauma or bleeding, our first recommendation is to go to the emergency room. You will be treated more quickly for life-threatening emergencies at the ER. Remember, if it’s painful, it’s an emergency and should be addressed as soon as possible to increase the chances of saving the tooth and reducing damage to the nerves and tissue. Don’t panic! First, find the tooth and brush it off gently. Don’t run water over it unless it’s covered in dirt. Place the tooth into a small cup of milk – yes, milk. Press a clean cloth against the space in your gums where the tooth was knocked out. Then call our office to let us know about the situation, and we’ll make time in our schedule for you to see Dr. Pate. He might be able to replace the tooth, depending on the break and the damage. What do I do if I have a toothache that’s so severe I can’t sleep, eat, or think straight? Please call our office for an appointment! We’ll fit you in as soon as possible. Take Tylenol or Advil to temporarily help ease your pain. What do I do if my temporary or permanent crown falls off? If you can find the crown, rinse it off and keep it. If the crown is not broken, use a dab of toothpaste or temporary cement (available at the drugstore) to reattach the crown. Then call our office and we’ll set a time, probably the same day, for you to see Dr. Pate. The best treatment for an emergency is prevention! Preventive treatment is obviously easier, more cost effective, and significantly less stressful (on your body and your schedule) than undergoing emergency treatment. Although some emergencies cannot be prevented, many are preventable. For example, you should wear a mouth guard while engaging in sports. In addition, regular preventive care visits with Dr. Pate will help you avoid unexpected toothaches by identifying developing dental issues. You can take care of them before they become a painful nuisance!